I also did not describe the illustrations within the pages. At the beginning of each chapter, true to its identity as a children’s literature book, a black-and-white picture faintly hints at what is to come in the following pages. As if US illustrator Mary GrandPre set fine charcoal to the pages, the thick grayscale illustrations match her front-page style of skillful shading and blending, masking grand portions of the pictures in darkness. 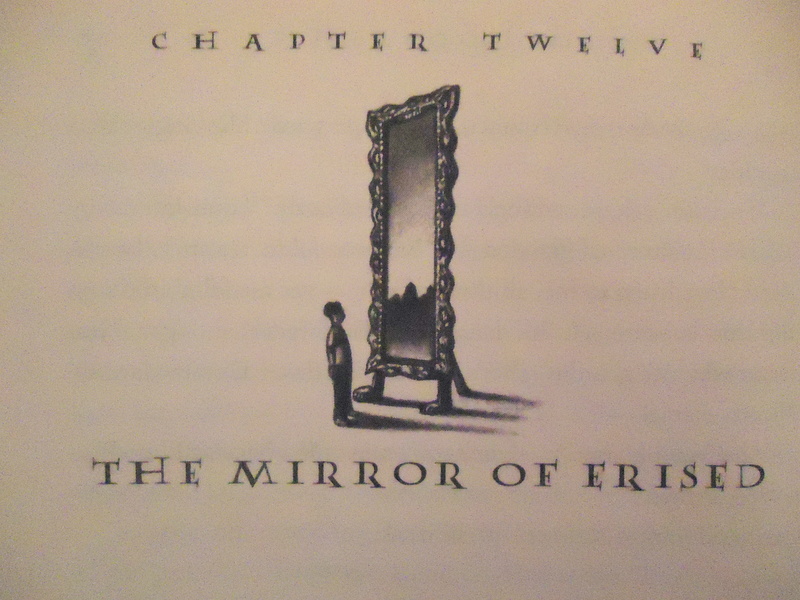 Unlike the much more realistic illustration on the front cover, the smaller chapter pictures feature thicker outlines, oftentimes identifying Harry by little more than their body outlines, a few clothing details, and hair, such as the illustration for Chapter Twelve, the Mirror of Erised. While my pictures provided a familiar view of the book to many in our age group, sometimes referred to by columnists and fans as the Harry Potter Generation, there are several distinctions between the American paperback versus hardcover illustration. Behind the embossed metallic font, the American front cover features a young black-haired boy in a yellow and red striped shirt, blue jeans, and a red cloak hanging from his neck, flying on a thin, wooden broom through two stone pillars, decorated by an intricate swirling design. His arm extends to catch a tiny gold ball with white wings, the gold hue and yellow blur of movement nearly blending into the brown stone. Behind the boy, a unicorn dashes from the middle out towards the woods on the left side of the cover; three beastly dog faces growl from the shadows of a castle on the right; small purple shadows of people on brooms stand against the pink-purple sky. 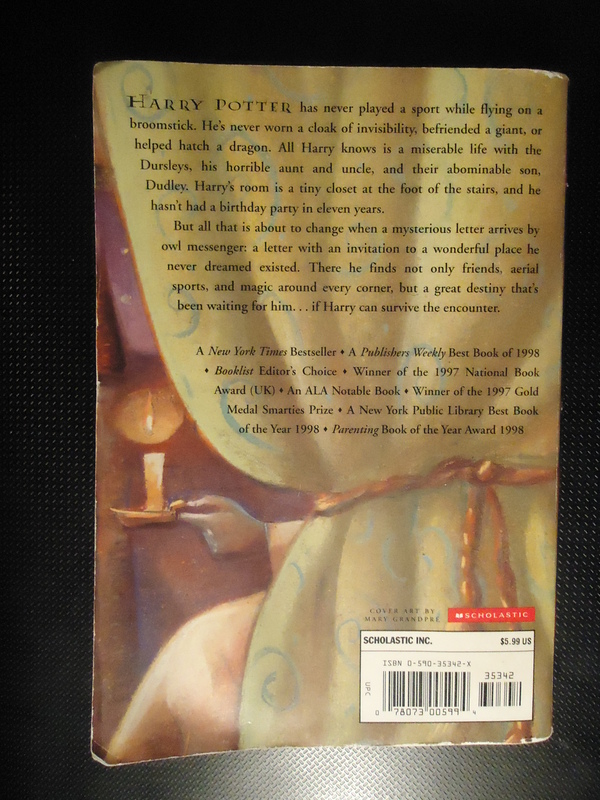 While a golden “Harry Potter” stands out from the illustration, the rest of the title disguises itself in the middle archway. 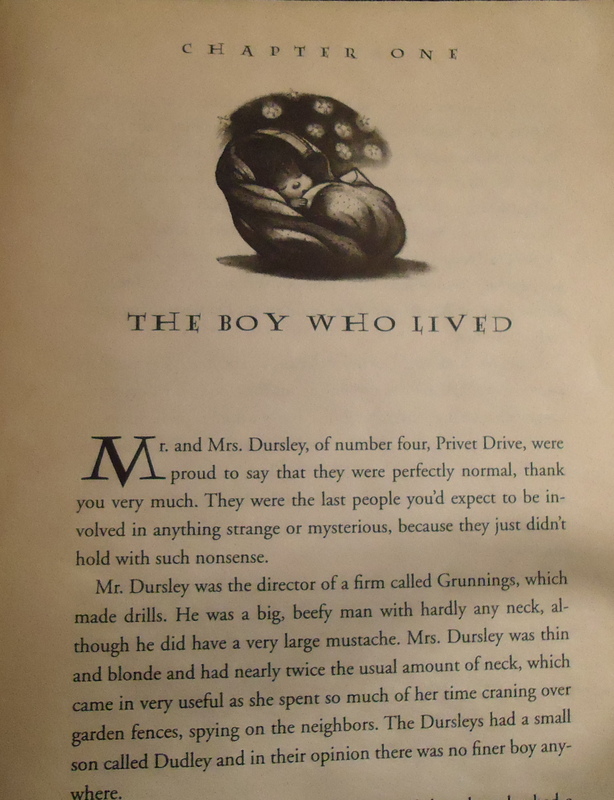 At the bottom, behind the embossed “J.K. Rowling,” a slightly opaque blue-and-red diamond strip covers the bottom pillar rungs and the thin grass landscape; the spine repeats the design. The front cover image prevails across most American copies, paperback or hardcover, although newer editions are significantly lighter, as if a graphic designer turned up the brightness and contrast in Photoshop. The back cover, differing from its hardcover counterpart, gives way to the light-hearted summary written upon the green drape (pictured to the right). Behind the drape, a dark hand decorated by peach cloth holds a similar-color candle on a brass candle-holder; the bright candlelight hardly illuminates the purple-brown blur behind. I do not believe anyone knows who this mysterious man might be, especially since this back cover only exists on paperback editions. As many more people turn to hardcover editions for material examination—perhaps because of promised longevity of the artifact—everyone recognizes Hedwig and Dumbledore on the back of the version’s book sleeve. Although the peach-clocked man behind the green drape exists on the front-inner flap of the hardcover sleeve, Google Images reveals the figure’s arched bare foot, as if tiptoeing to his next destination. The figure, although still mysterious, could be linked up to the actions within the book, as several characters snoop around the castle at night to find the Sorcerer’s Stone. on the front of the red train, overtly proclaims its presence; the “9 3/4” sign towards the top looks like a piece of parchment floating in the sky; and stars within the smoke evoke magic rather than a realistic portrayal of stars with bright colors and skewed angles. 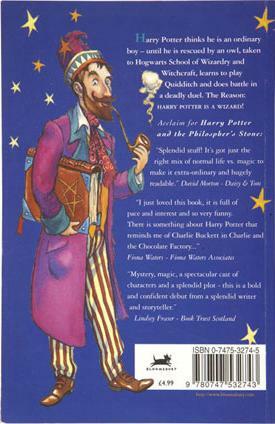 The first back cover featured a wizard named Wizzy, created by illustrator Thomas Taylor and completely unrelated to the book content, donning a very odd wardrobe of purple and brown, carrying a large brown book, and smoking a pipe. The book description is just as silly: “Harry Potter thinks he’s an ordinary boy — until he is rescued by an owl, taken to Hogwarts School of Witchcraft and Wizardry, learns to play Quidditch, and does battle in a deadly duel. The Reason: HARRY POTTER IS A WIZARD.” After a few editions, Wizzy is replaced by Albus Dumbledore holding a Puter-Outer, and the summary receives slight renovation, though nothing compared to the eloquent, enticing summary on the US editions. Of course, by the time the novel reached the US, Americans were already ecstatic about the story, buying UK editions. The US cover reflects achieved fame, while the UK cover expresses a small hope in a long, complex children’s story nearly unprecedented across the globe. Many differences between the UK and US editions amassed plenty of critical examination and pages of online content. 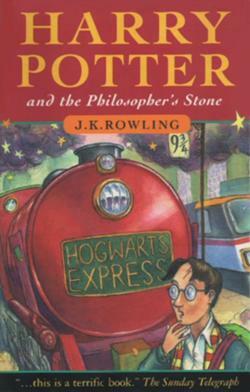 As the most apparent change between the versions, Scholastic altered the title from “Philosopher’s to “Sorcerer’s” when buying US copy rights because the publishing company believed no child would read about a “philosopher.” America is also not as familiar with the legend of the “philosopher’s stone,” a legendary alchemist substance capable of turning base metals to gold or silver and as an elixir of life (just as described in the novel). Otherwise, one of many sources for each word change between the books can be found here at the Harry Potter Lexicon, another fan-made website for Harry Potter needs. I love this post! It’s interesting that you compare the two different books– seeing as I grew up with the British versions for books 1-4, and then the American ones for 5 and up. I have the one with the random wizard on it. I didn’t know that they changed that illustration!! When they first came out in Britain I remember there was also another cover as well – I remember it being mostly black with a train on it (it was referred to as the “adult” version). This post makes me think of how we grow accustomed to objects appearing a certain way. I grew up with the British covers, and then when I moved to America I HATED the American covers. To me, they just weren’t “Harry Potter”, even though the objects were exactly the same on the inside (besides the illustrations). It’s funny that you think the US summary is more “eloquent and enticing”… once again, most likely because it was not what I grew up with, I find the UK version much more appealing. I’ve noticed a very large difference between drawings for books between England and America as well. I think that just shows how different cultures value different things when it comes to books and illustrations. Wow, your post really, really makes me want to go back home and read my physical copy of harry potter. I love your description on the different pictures, and I’ve never actually seen the UK version of the the book before. 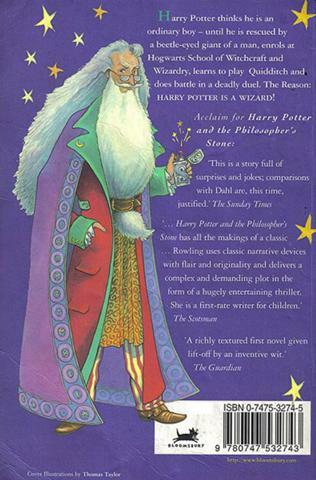 While I do prefer the US cover art and pictures, I wish the title was kept as the philosopher’s stone. Oh mann, just looking at the small pictures before each chapter gives me memories. I loved those little pictures because they were always cryptic at first, but then they made sense by the end of the chapter!